I guess it was “take your pajamas to work day” in Brazil. 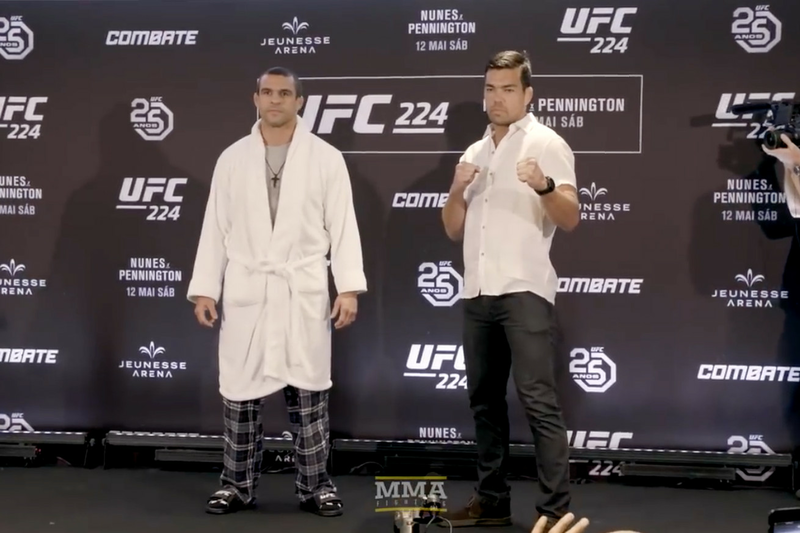 I’m not sure how else to explain Vitor Belfort’s bathrobe at the UFC 224 media day, designed to promote the upcoming pay-per-view (PPV) event this Saturday night (May 12, 2018) in Rio. Credit to opponent Lyoto Machida for staying in character. Also coming nose-to-nose were Amanda Nunes and Raquel Pennington. They’ll collide for the women’s bantamweight strap in the five-round headliner, while Ronaldo Souza and Kelvin Gastelum try to stay alive in the middleweight title chase by way of UFC 224 co-main event. See the entire UFC 224 fight card and line up here. MMAmania.com will deliver LIVE round-by-round, blow-by-blow coverage of the entire UFC 224 fight card on fight night (click here), starting with the Fight Pass “Prelims” matches online, which are scheduled to begin at 6 p.m. ET, then the remaining undercard balance on FX at 8 p.m. ET, before the PPV main card start time at 10 p.m. ET. For much more on UFC 224 click here.